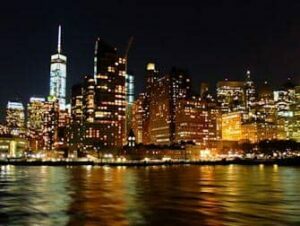 The New York Night Tour is an extensive guided tour of Manhattan. You’ll walk through the High Line Park, see the skyline from the water and climb the Top of the Rock all in one tour. I have done this affordable tour and can definitely recommend it. You’ll see a lot of the city in just a couple of hours. The tour starts at 18:00 in Midtown Manhattan. You’ll travel by bus through Manhattan to the High Line Park, which is a park built on an old railway. With the guide, you’ll take a stroll through the park that will take approximately 30-45 minutes. Depending on the season, you might see the sunset or it might be dark already. The guide knows a lot about New York and there’s an opportunity to also ask questions. After a nice stroll through High Line, the guide will accompany you on the bus as you head to South Street Seaport. Here you’ll board a New York Water Taxi and cruise past the illuminated skyline. The onboard guide narrates the cruise and tells you which landmarks you pass by while you enjoy a complimentary glass of champagne. You’ll be able to take photos of the Statue of Liberty as the boat stops in front of it for a moment. You can sit either inside or outside and there are snacks and beverages available for purchase. 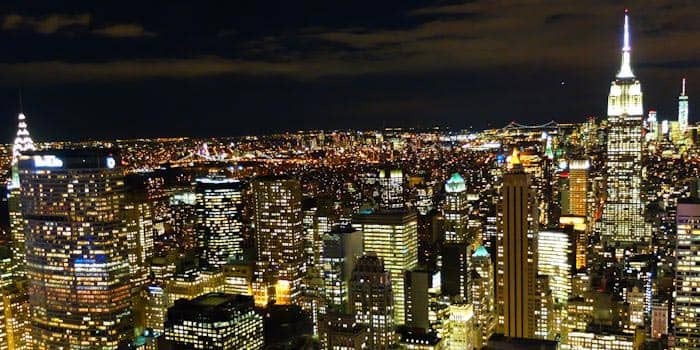 To top it all off, you’ll have the option to visit Top of the Rock to view the city from the observation deck. The views of the Empire State Building and other well known buildings in Manhattan are beautiful. If you’re too tired at this point, It’s possible to save your Top of the Rock tickets for another time. The tickets are valid for a couple of days. Eric’s Tip: I really enjoyed this tour as you get to see a lot of Manhattan in one evening. 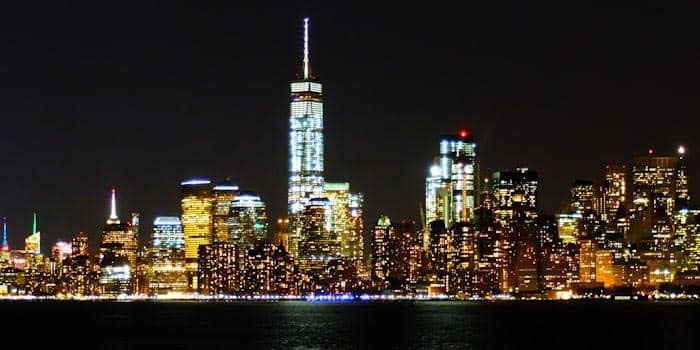 If you’re visiting New York only for a few days, you could plan this tour for your first evening. That way you’ve already seen quite a few sights on your first night. This tour is currently unavailable. You can book a Night Tour by bus here.